Many people cite the world demand for seafood and fish as the real culprit for destroying coral reefs, wetlands and ocean beds, but other environmentalist blame the methods and practices of the fishing industry. These practices have devastated the ocean floor eco-systems in many places so that marine and aquatic life can no longer be sustained. In order to lessen the impact of commercial fishing and overfishing that reaches beyond the ocean floor and into entire aquatic eco-systems, a global conservation effort is needed. According to the November 2006 journal issue of Science, the single biggest threat to seafood and fish species around the worldis bad fishing practices. The journal reports that, according to leading marine biologists, if fishing practices are changed, the world's fish and seafood resources will be depleted by the year 2048. 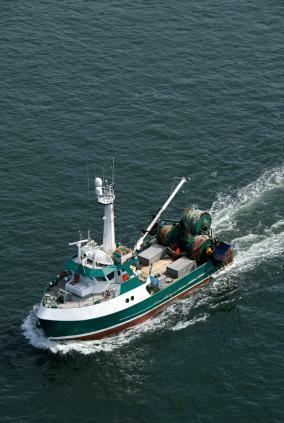 Bottom Trawling: Trawling along the ocean floor is done with a net. According to a 2005 report submitted to the United Nations Millennium Project, one run of bottom trawling is responsible for the destruction of five to 25 percent of the seabed life. By-Catch: Unintended fish get snared in fishing nets. This fishing byproduct is best illustrated by the tuna fishing industry and the by-catching of dolphins. Those concerned by this method of fishing protest by purchasing only dolphin-free tuna, meaning that no dolphins were caught, killed and discarded in the tuna fishing process. Coral Reef Destruction: Coral reefs, the highest biodiversity examples of marine ecosystems, have been destroyed through overfishing methods. Destruction of Food Webs: One of the worst environmental impacts is when a specific fish species is targeted for harvesting due to high demand. Harvesting large populations of certain species creates an imbalance in the natural prey/predator food chain of marine life. Dynamite and cyanide fishing: These two techniques are illegal in much of the world, but some countries still practice these methods. It's obvious that these techniques leave irreparable damage to the ocean floor and marine eco-systems. Fishing Gear: The use of environmentally-harmful fishing gear destroys countless ocean beds. Overfishing: The unregulated amount of fish caught during a season created a fishing industry that was determined to catch as many fish as possible as quickly as possible. This resulted in overfishing and a tremendous amount of dead fish waste. One possible solution to the environmental issues created by fishing is marine conservation. There are several steps being taken in an effort to protect and preserve the marine eco-systems through good fishing practices and methods. LAPP (Limited Access Privilege Programs) and ITQ (Individual Transferable Quotas) also known as catch shares is a fishing system designed to ensure each fisherman has a share of the season's catch. This regional allotment is known as TAC (Total Allowable Catch). LAPP attempts to control how much fish is harvested in the hope of conservation of the fish population. Like all allotment systems, most fishermen can sell or buy shares to increase their profits beyond their original allotment. The LAPP systems attempt to eliminate excessive waste, create better fishing practices and allow fishermen to see a higher profit. The LAPP systems removed the competitive nature of seasonal fishing and the urgency for catching as many fish as possible, often resulting in large amounts of dead fish that had to be disposed. Another benefit has been the reduction in the number of fishing boats and destructive gear. By putting the LAPPs in place, the fishing industry believes it has found a way to make fishing a sustainable industry. While there are decided industry issues surrounding the implementation of LAPPs among the fishermen, the side benefit of an improvement in the ocean and sea environs remains controversial. Protected wilderness areas along the ocean beds and coral reefs, called MPAs (Marine Protected Areas) are helping to rebuild threatened fish species, and populations are on the rise. In addition, these areas are seeing a revitalization of their aquatic and ocean eco systems. As sanctuaries, all fishing, mining and offshore oil drilling are prohibited. Another solution to harvesting fish in the wild is fish farms also known as marine aquacultures. Salmon and shrimp are two of the most popular fish and seafood species grown and harvested on fish farms. One of the side-effects of fish farms that can create other environmental issues is the waste product they generate and must be disposed so as not to upset the fish farm eco-system. This is also a controversial environmental issue since the pro is a relief to the overtaxed wildfishing resources while the con is an overstocking in the wild that creates an imbalance among the fish species. The Pacific salmon was overfished and in 1970, the United States, Japan, Russia and Canada released over 500 million salmon fry into the Pacific Ocean. In 2008, they released over 5 billion more. While these numbers seem astronomical, even "wild" salmon have a low survival rate due to predator culling. The oceans cover two-thirds of the world, yet their feeding grounds are limited. A recent article of the American Fisheries Society predicts that when coupled with fish overpopulation many fish species could starve. According to Greenpeace, fish such as marlin, flounder, tuna and other large predator fish species are significantly down, demonstrating an imbalance. This imbalance is also indicated by an increase in other fish species. While there isn't a single solution for the environmental issues created by the fishing industry, conservation appears to be the best approach.